As a performance marketer, there’s never a day when I’m not using an analytics platform to measure the performance of my campaigns. It’s extremely important to track and measure advertising spend and understand how people are engaging with the assets you’re promoting. If you’re looking for a way to prove the effectiveness of your marketing efforts, then you’re in the right place. 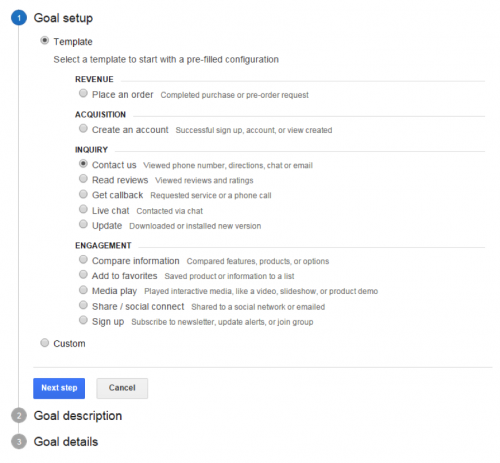 In this post, I’ll walk you through how to set up and define goals and conversions, tag your advertising campaigns for consistency, and analyze the data for actionable insight on Google Analytics. Goals are essential, allowing us to see conversions, conversion rates, and conversion values. From making a purchase to downloading a whitepaper or requesting a demo, tracking goals is critical in evaluating the quality and value of traffic to your website. It’s important to measure different segments, understand how people are engaging with your site and content, and see what the outcomes are. 1. To begin, make sure your account has editing permissions, otherwise you won’t be able to set this up. If you haven’t already, you must install the Google Analytics tracking code on every single page of your site. 2. Log in to Google Analytics. Select the Admin tab and navigate to the desired account, property, and view. 3. In the VIEW column, click Goals. 4. Click the red + NEW GOAL button. 5. 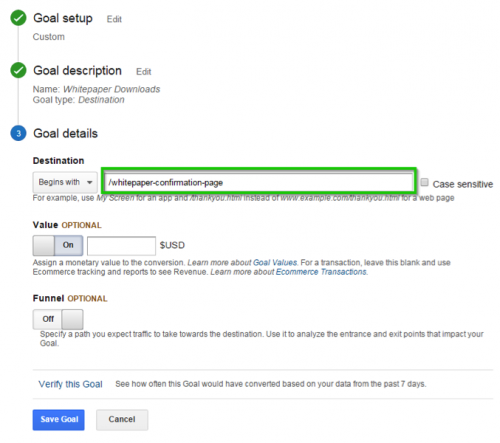 Follow the steps and click on the most relevant goal option for your business. 6. 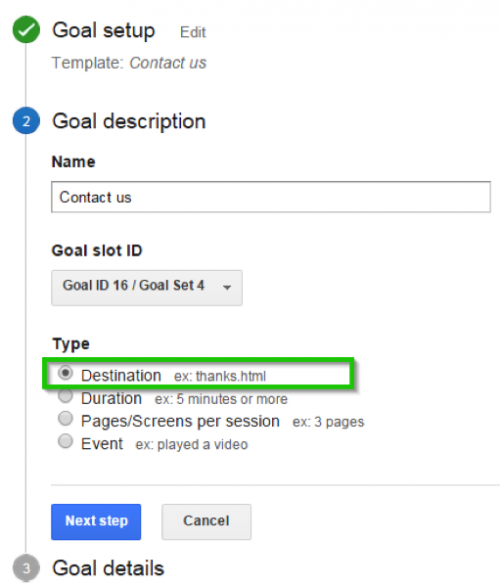 Name your goal conversion and select ‘Destination’ as your goal, then click on the ‘Next step’ button. 7. Set your destination to the applicable choice of equal to, begins with, or regular expression. Then add your goal confirmation/thank you page URL. In most cases, it would be equal to. 8. Optional: If you wish, you may assign a monetary value to your goal or turn on the funnel (if you have required steps leading to your conversion). 9. Save Goal and you’re good to go. You may also click on Verify this Goal and see how many people landed on this page in the past 7 days as a validation. Now that you have goal tracking figured out, the next step is to tag all of your advertising efforts with consistent landing page parameters in order to get a clear view of what channels are most effective. For a basic understanding of how this works, please refer to Google Analytics’ URL builder. There is no absolute way to do this and it depends on how you want to structure your advertising for ease of reporting, but once you develop the model, it is important that you stick with it. Here’s how I apply the utm parameters in order to understand performance for Marin. No matter what you decide to put in these parameters, it is very important that you use the same naming convention throughout. If you don’t have a clear understanding of how to use utm parameters consistently, it will get very messy and be very difficult to understand your data. Example Scenario: I need to promote our 2015 Mobile Report on various channels – Facebook Ads, Twitter Ads, and Linkedin Ads. This is how I would setup the landing page utm tags per channel based on the type of advertising that’s running. Do you see the consistency? The campaigns are all labeled the same naming convention, 2015Mobile Report, for all channels. The source and medium are the same labels that I’ve used throughout time for all marketing initiatives. For the content parameter, I use the ad name if the channel relies on a banner, otherwise I use it to evaluate groupings of my target audience. Let’s do a quick dive and put these consistent tracking parameters into action by analyzing the data using the tags indicated, in addition to looking at goal completions to see how many people converted. 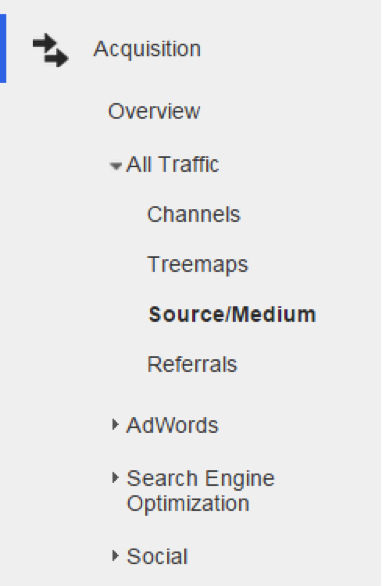 • Navigate to the left side and click on Acquisition > Campaigns > All Campaigns. • Type in the campaign name in the search box and click on the magnifying button, then click on the campaign name to drill further into. • By default, you will find all the source/medium traffic associated with that campaign. You can toggle the conversions drop-down if you have a specific goal you’d like to check against to see what channel is most effective. In this example below, you will see all the tags I mentioned in the example scenario above. Example Analysis: Taking a look at each source/medium for the 2015 Mobile Report campaign, I can see that most of the website traffic and conversions are coming from facebookwca and linkedin-su. I can back into the cost per conversion by getting the advertising spend. So, say that I spent a $1,000 on facebookwca and $1,000 on linkedin-su, the cost per conversion in this scenario would be $16.13 ($1000/62) for facebookwca and $17.24 ($1000/58) for linkedin-su. As for the other campaigns, I expected the low results because they are new campaigns that were recently set live. To do a high-level source/medium analysis, navigate to: Acquisition > All Traffic > Source/Medium. The steps for analyzing both are similar to the steps indicated in the campaign analysis – you simply type in the parameters you used in your URLs and your data will populate. If you have any questions, feel free to leave a comment. By spending time analyzing your marketing campaigns, you are one step closer to becoming a performance marketer.